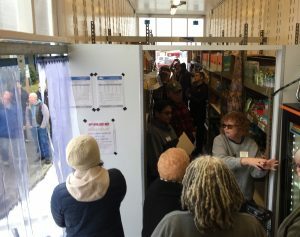 Having you been looking for your chance to join the largest, oldest food bank network in Pierce County? Do you want to apply your organizational and customer service skills to help support your neighbors in need? Nourish is hiring an Administrative Assistant! This part-time position is an essential Nourish staff member. Their primary responsibility is to help Nourish’s administrative office operate professionally and efficiently. By helping Nourish operate effectively, they support Nourish’s mission of providing food and support services to people in need with compassion, dignity and respect. 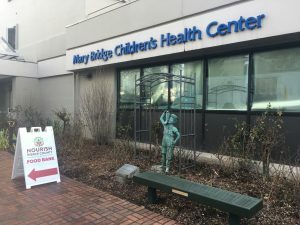 If you shopped at a Safeway or Albertsons last fall, your cashier might have asked whether you want to donate a bag of food to fight hunger. Thank you to all of you who said yes! 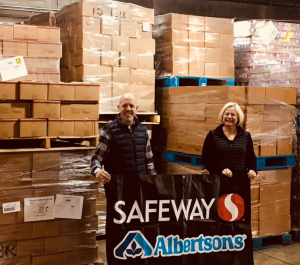 Safeway and Albertsons corporate offices collected all the donated funds together and used their bulk purchasing power to buy essentials for food banks. In coordination with our partners at Northwest Harvest, Safeway and Albertsons delivered this food to our warehouse so we can get it into the hands of people in need. The picture above shows Kevin, a local Safeway store manager, and Kate, the Edgewood Nourish Food Bank manager, at Nourish’s warehouse. Thanks to all of your donations, Nourish received 117 pallets of food in January. The shipment was full of food bank staples like peaches, beef stew, canned vegetables, peanut butter and canned ham. Nourish clients will see these items show up on the shelf in the coming months. The 117 pallets we received will have an enormous impact to help keep our food bank shelves stocked this year. Last year, Nourish shared six million pounds of food with our neighbors in need, so these pallets represent about 5% of what we distribute in a year. Thank you to Safeway and Albertsons stores and also thank you to everyone who donated at the register last fall!